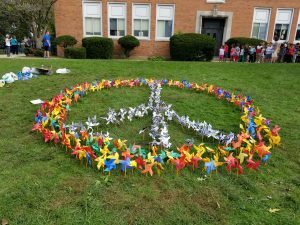 Once again, our school is proud to participate in the Pinwheels for Peace project where children around the world display pinwheels of all different sizes as a public visual of “Whirled” Peace. Many thanks to Mrs. Katz, our art teacher, for creating the beautiful display on our school’s front lawn. With her help, each child in our school made a pinwheel with words of peace and harmony written on it. Then they placed the pinwheels in front of our school. With this simple act, we join many schools and people around the world in our hope for world peace. This entry was posted on October 1, 2018 and tagged special event, Whirled Peace Day. Bookmark the permalink.